I’m a little slow in posting, but I have had a busy mailbox recently. 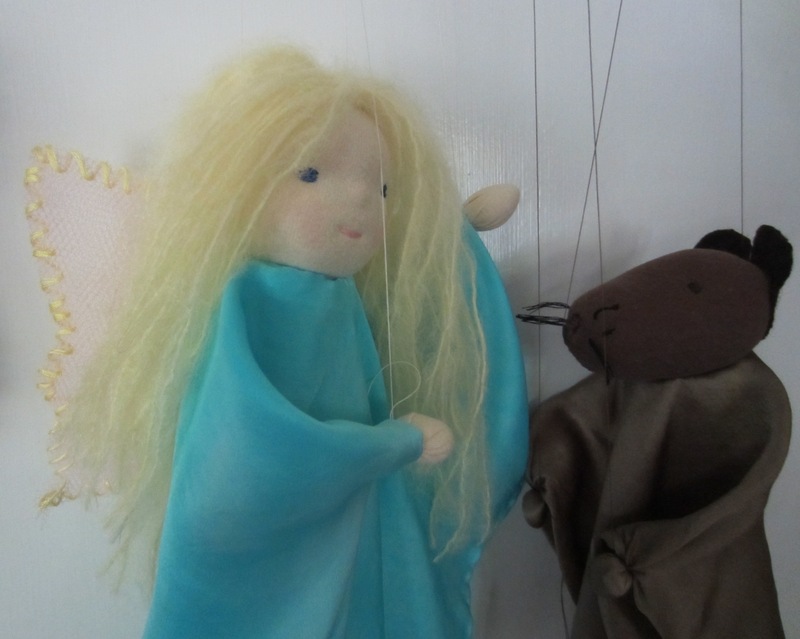 I was fortunate to swap marionette puppets with 2 lovely puppet makers. I received the one on the left from Glori. 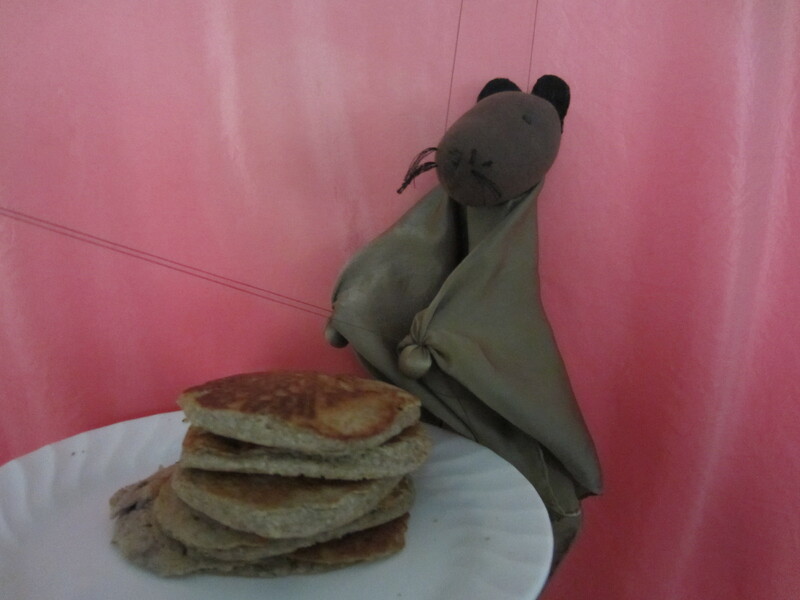 See her tutorial at http://stracciepupazzi.blogspot.it/2012/08/jeremy-mouse-la-nascita.html?m=1 . And the needle felted head one from Kelly in PA. 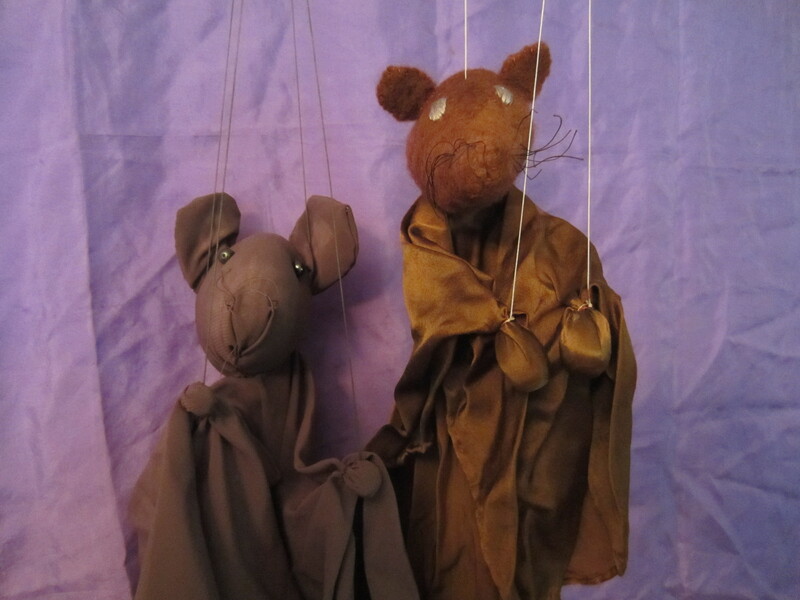 These Jeremy (and possibly a Jemima Mouse) puppets are a part of the Puppet Swap I co-hosted over the summer with Margaret at We Bloom Here. 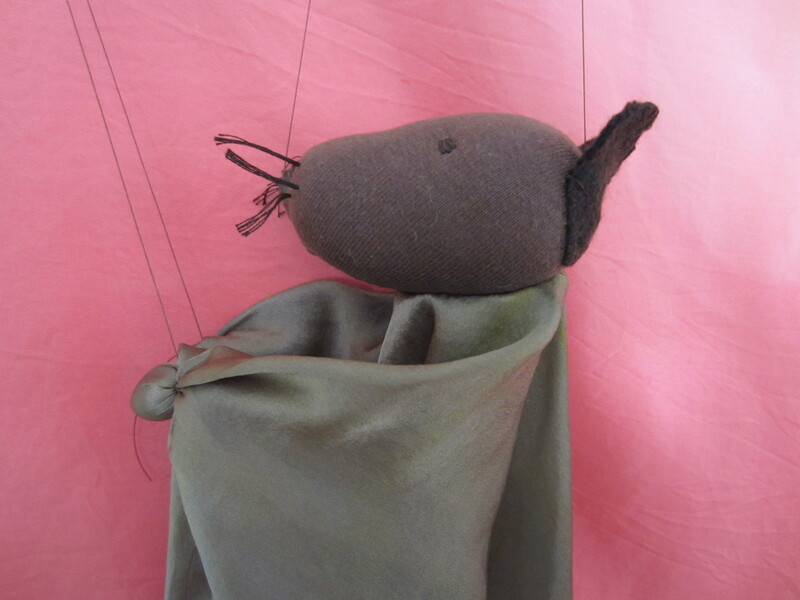 These 2 mice will join a Tiptoes marionette for my little puppet loving Tiptoes fan for a holiday gift. Hmmm, with 3 puppets, maybe we should make one of those cool racks on pg 130 of Toymaking With Children for what I’m certain will be a growing collection. 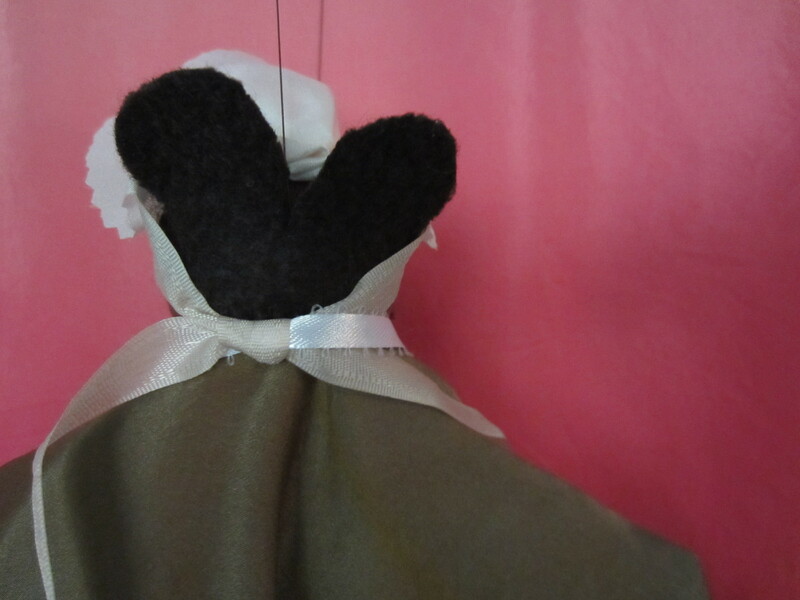 A Tiptoes marionette puppet is on its way to a new home! 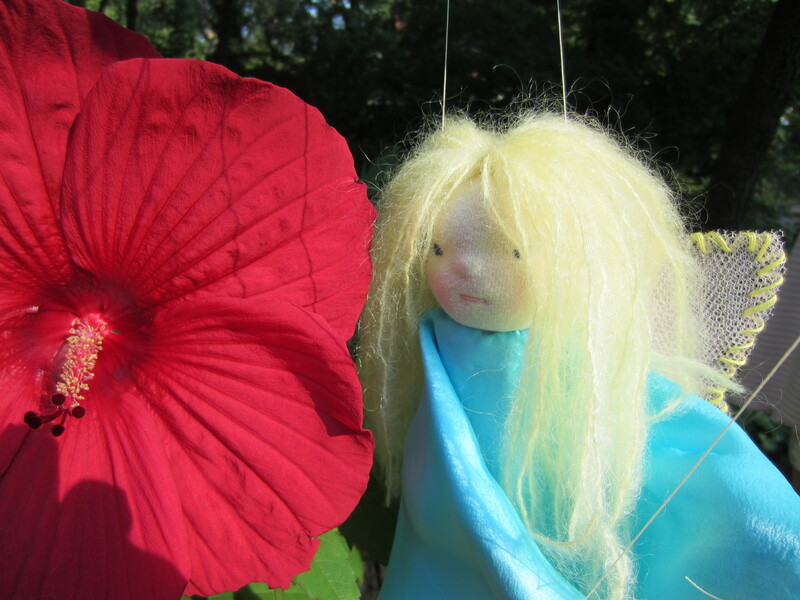 This sweet fairy will join Kelly’s family in PA as a part of the puppet swap we organized this summer. Watch for some amazing Jeremy Mouse photos coming up soon! 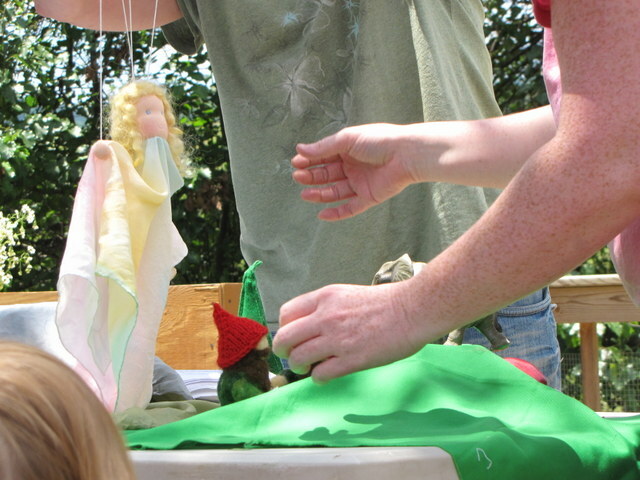 The last day to sign up for our Puppet Swap is Tuesday, July 24th. All the details and a timeline are listed at the Swap Invitation. We hope you will join in the fun and look forward to seeing your interpretations of these characters! In a very big tree. In her apron and cap. I first heard this story in Morning Garden, the parent/toddler program offered at our local Waldorf school. My daughter was just one and we were new to Waldorf parenting. I had always been a reader, but I struggled with the thought of making up stories for my daughter. I was so grateful when I read somewhere that there was value in a memorized story as well. THANK GOODNESS! The poem stuck with me from our sessions of Morning Garden, but I was very pleased to see Kind Mousie included in A Journey Through Time in Verse and Rhyme. I went with the quick and easy costume based on supplies I had handy. Sometime last year, I bought a scrap bag of silk from Waldorf Supplies. The scrap of white would do just fine for an apron and cap. 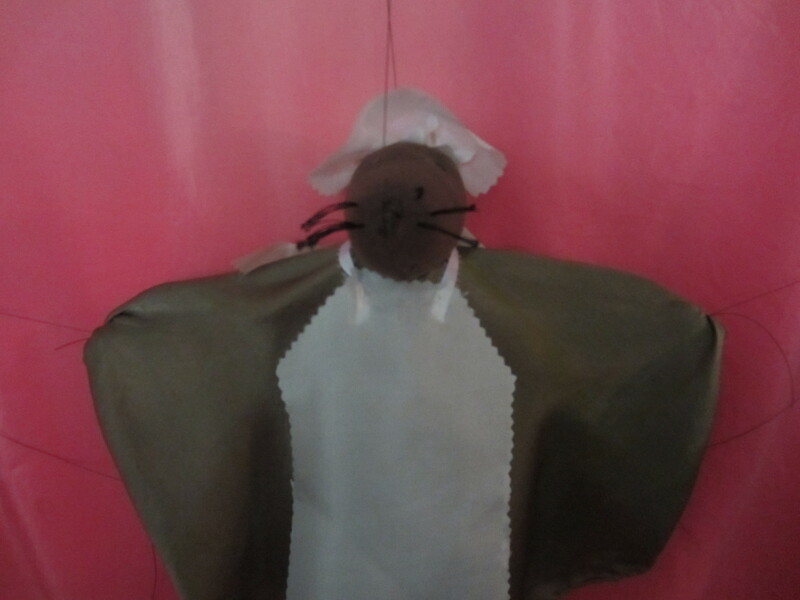 I was glad to have silk for the apron since the body was silk and it would help maintain the airy quality of the puppet. I originally thought I’d make some sort of dust cap with elastic, but then I decided a cap that tied on behind the ears would work fine too. I used a running stitch to attach a piece of ribbon to the silk and pulled it into a bit of a gather before knotting. Then I folded my oval-ish piece of silk. I think the cleverest part of this get-up is looping the apron ribbon in the cap tie. It keeps the apron from accidentally sliding down. With toggling posts between Joy Grows and We Bloom Here, we have posted lots of goodies over the past 2 weeks. We hope you have enjoyed the tutorials, ideas and stories. 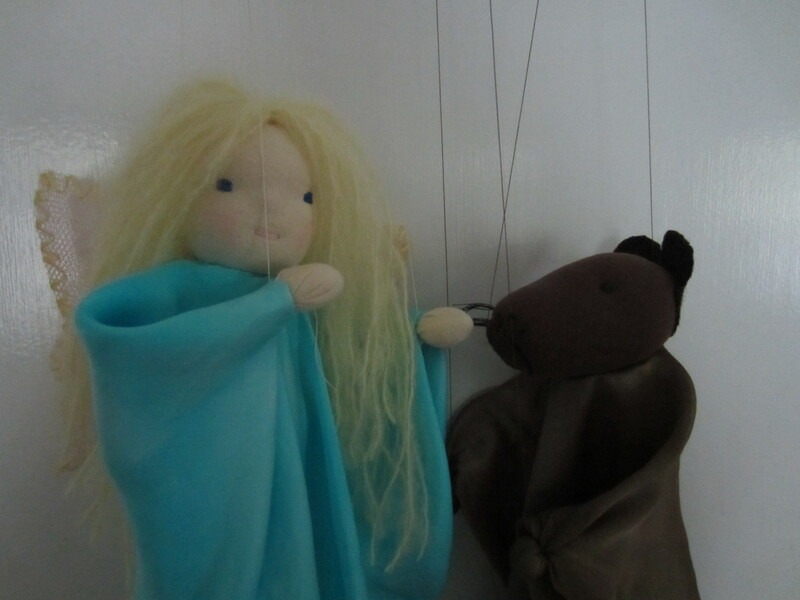 We look forward to continuing our puppet making conversation with you in our puppet swap. 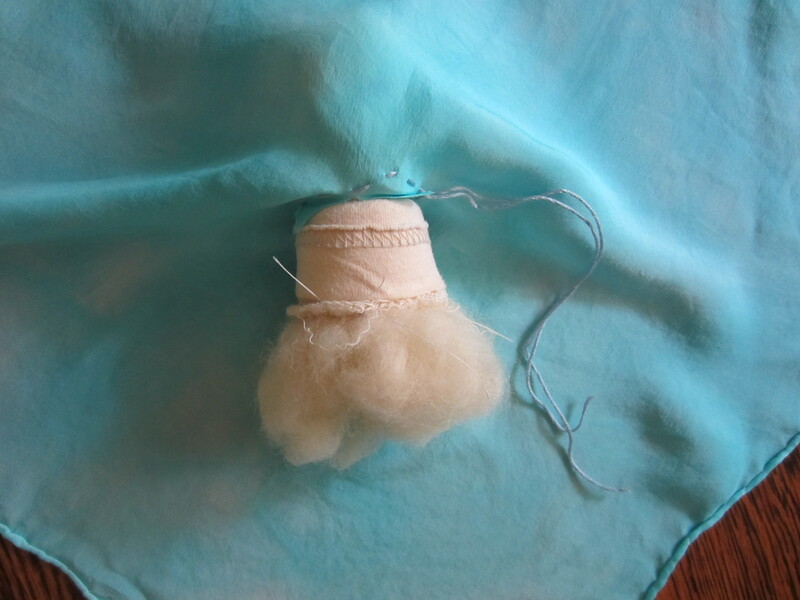 1” tubular gauze – I get mine from A Child’s Dream . 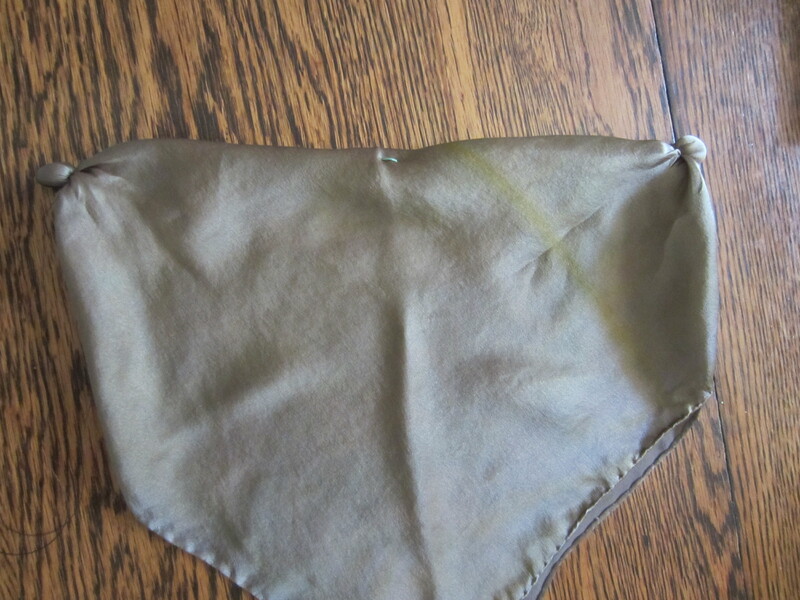 17” x 17” silk handkerchief – I got mine from Dharma Trading . Yarn for hair – I used some amazing merino dyed in chamomile by Mama Jude . Kool Aid- I followed the instructions to get Sky Blue at this tutorial . 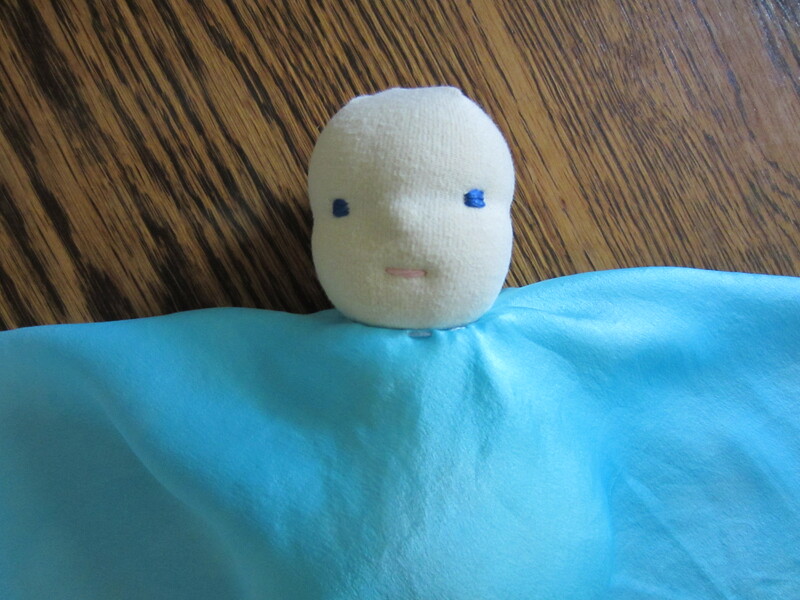 Make a “Waldorf doll” style head that is 2 ½ inches tall from neckline to top of head. See The Children’s Year, Toymaking with Children or Kinder Dolls for good instructions. 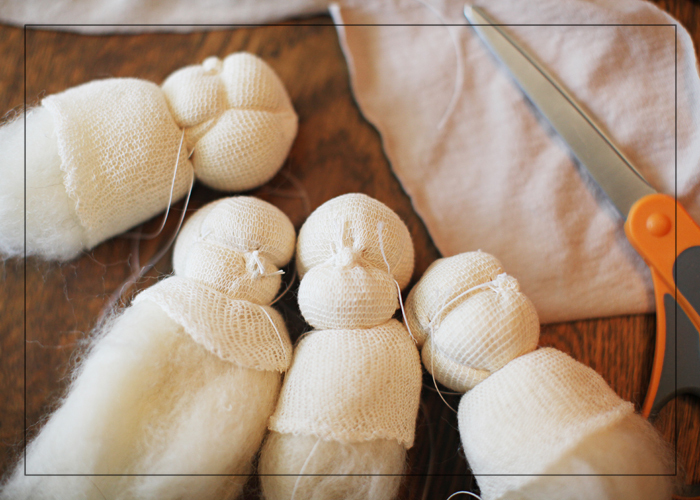 Also this Living Crafts blog post has some great photos. For my marionette puppets, I do leave a bit longer of a neck hanging down. I like having the extra weight below the neck string for balance. 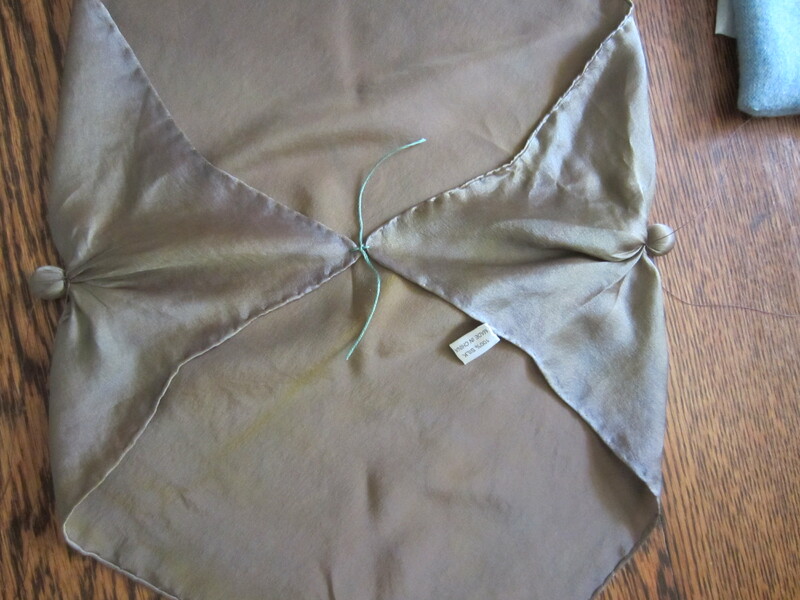 Cut a small X in the center of your sky blue silk handkerchief. I have seen instructions that say to cut a circle, but I like the small X better. I think you waste less of your material. 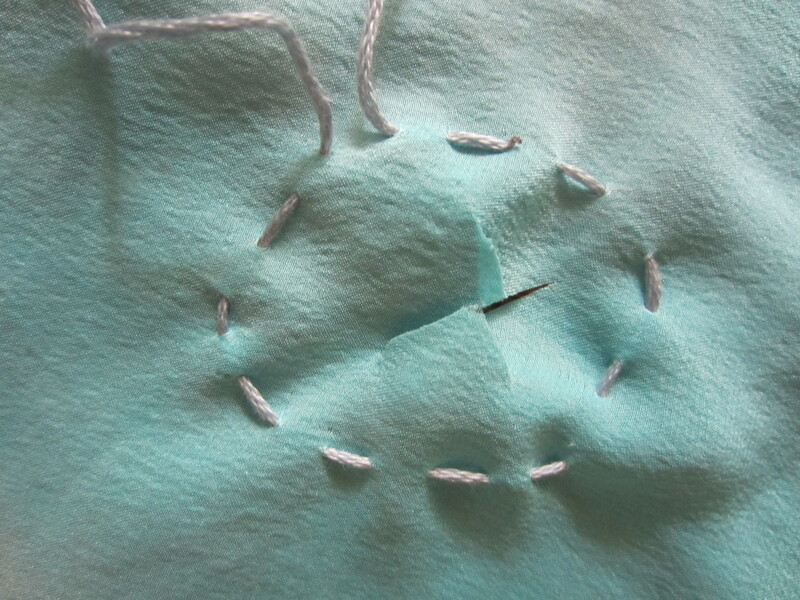 With a running stitch, make a circle around the X. The circle needs to be large enough for your doll neck to fit through. Leave the tails loose till you are sure your head is situated properly. 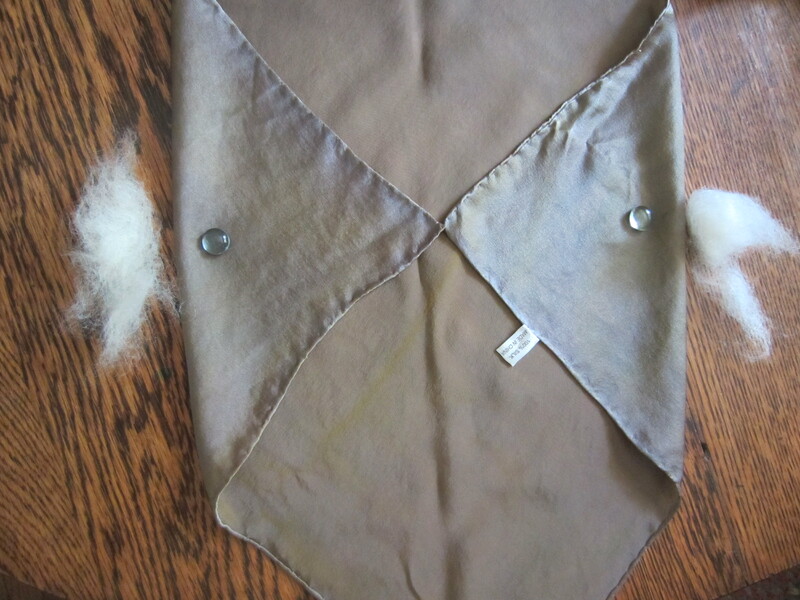 From underneath the puppet, you will be able to pull down and straighten the corners of fabric made from cutting the X. When the corners are pulled down and the silk is oriented correctly with the head, then you can pull the running stitch tight and tie in knots. 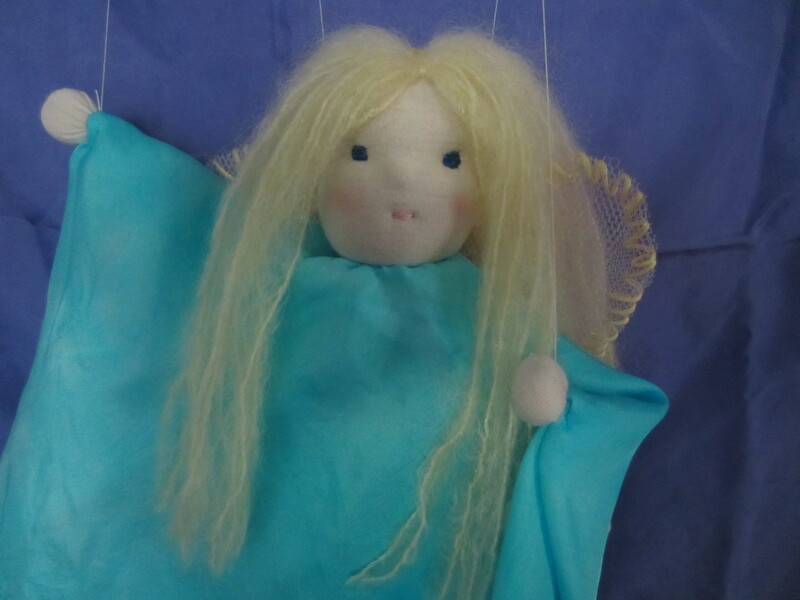 Flip the silk over to see your puppet’s face. I was lucky to find these oval shaped dew drops in my daughter’s dew drop basket. Any small dew drop or even a pea pebble would work to add a little bit of weight to the hands. 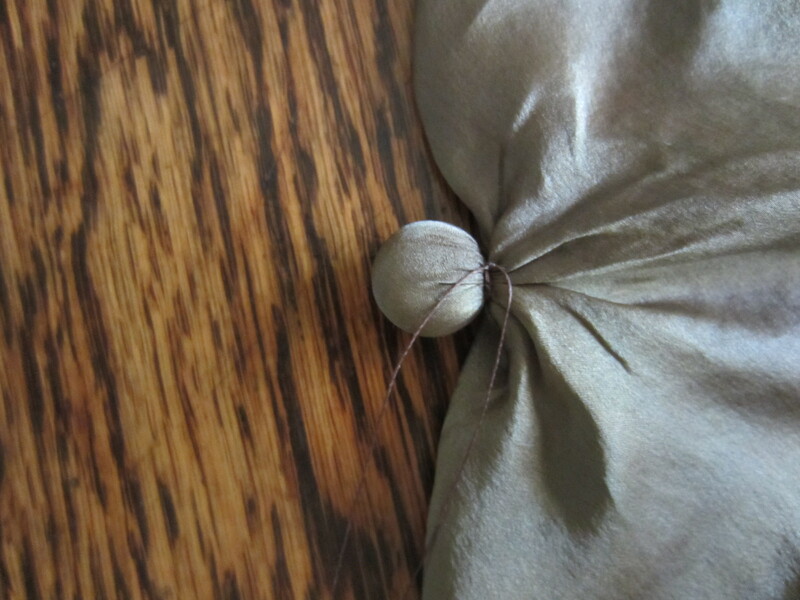 Wrap the dew drop in a little bit of wool, cover with a scrap of your skin fabric and tie. 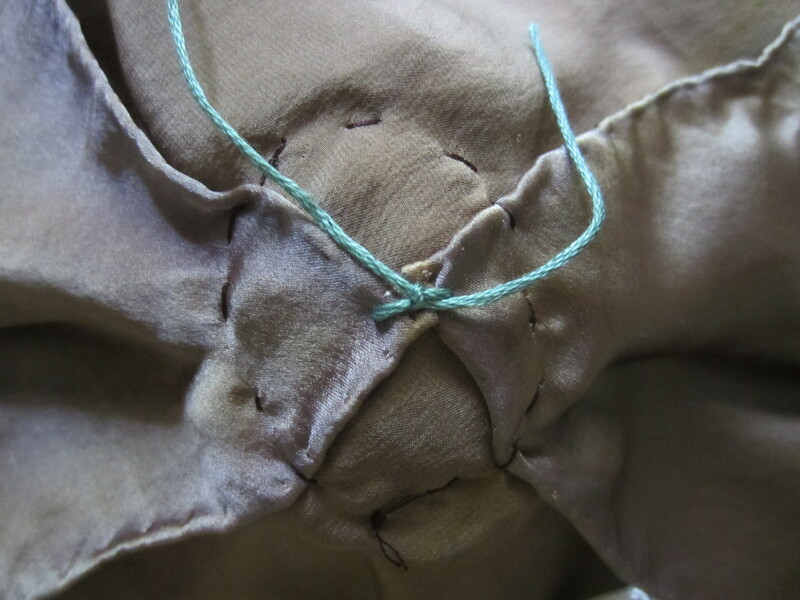 Bring the side corners of the silk to the middle and connect them together and to the body with one stitch. 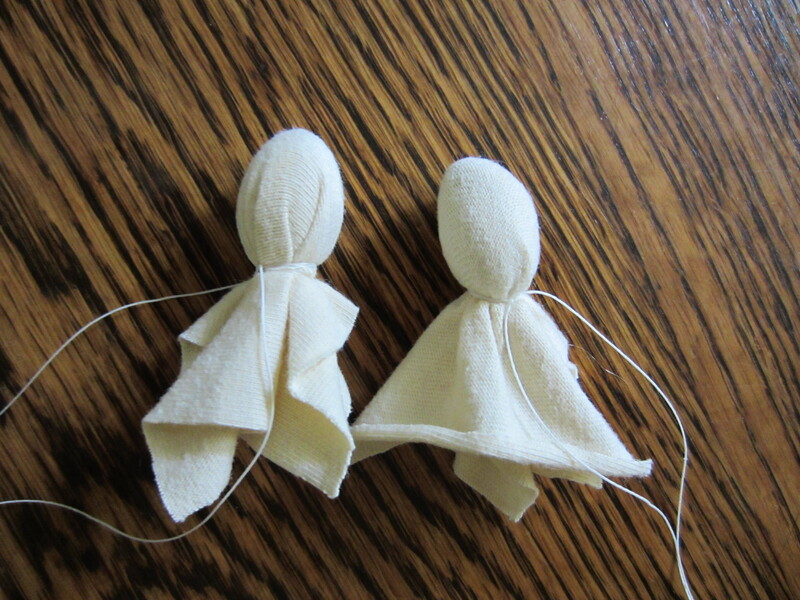 Place your newly made hands in line with the neck/where the silk will fold in half. It is possible to stitch around the hands through only the under layer of the silk (be sure to go through the wrist skin fabric too). This will allow you to attach the hands without any stitches showing. 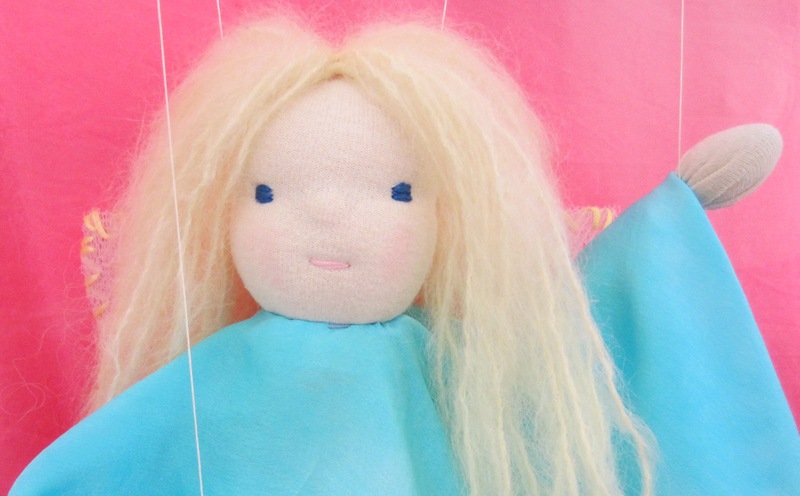 Now you can rosy her cheeks and add the hair. I used a 2 wig approach to her hair. 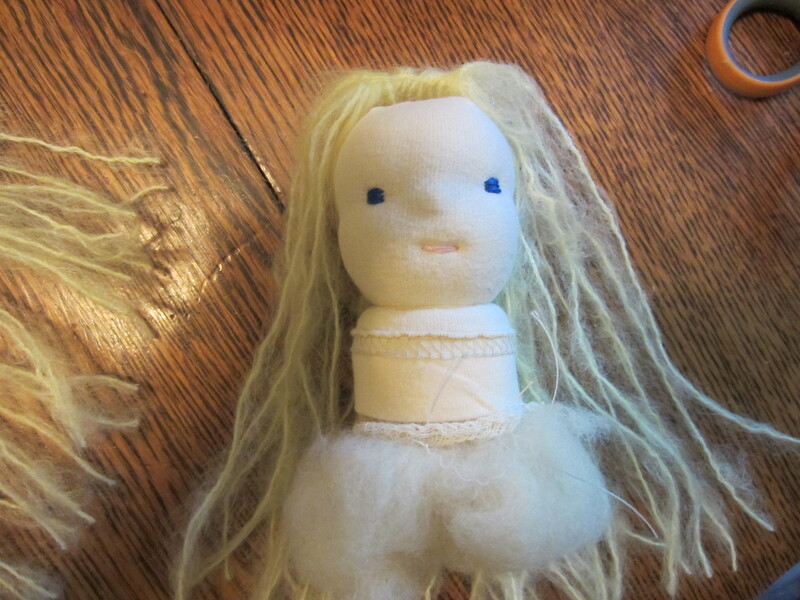 One gets folded in half at the seam and the other stays open and the seam becomes the middle part in her hair. The folded wig goes on first and is set back on her head. Stitch down on the fold of the yarn. 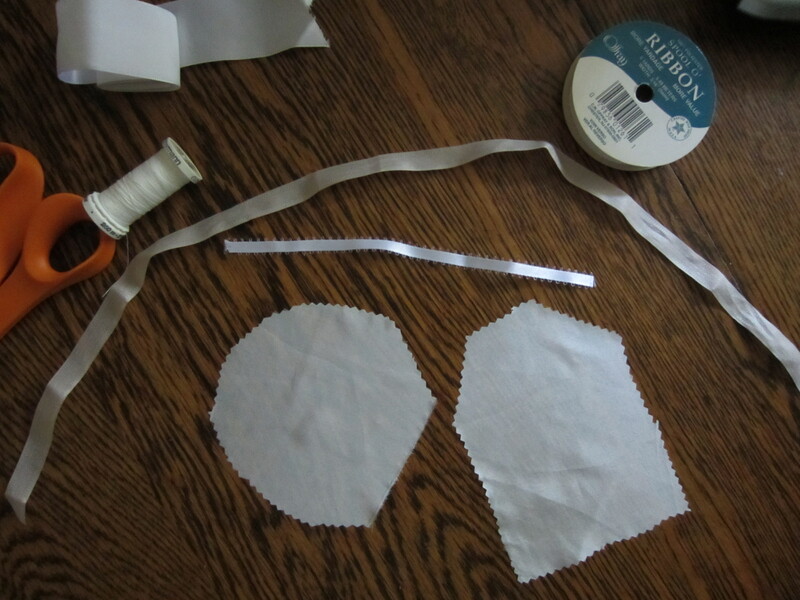 Then place the open piece on top of the head and stitch down on what would be the part down the middle . 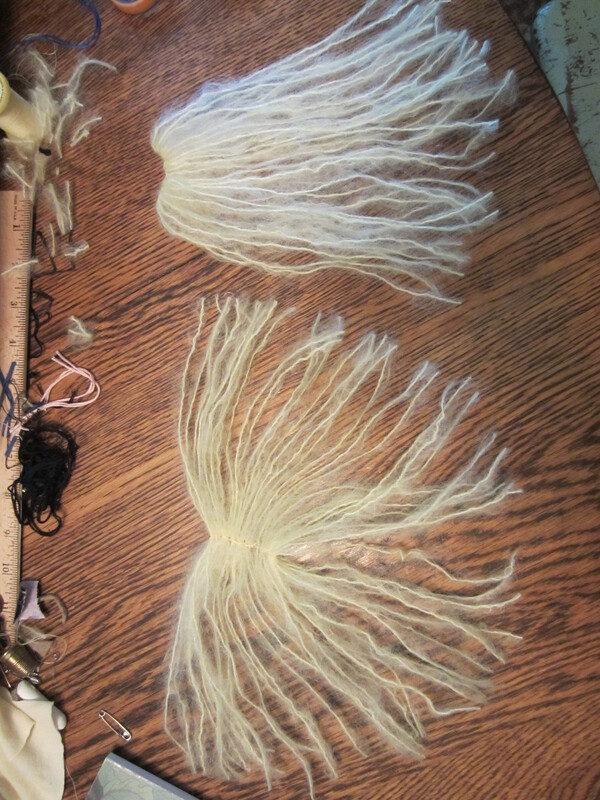 I like this method because even using this light hair yarn, my eye and mouth ends are completely covered. She has plenty of hair to frame her face as well as enough to cover the stitches used to attach her wings. 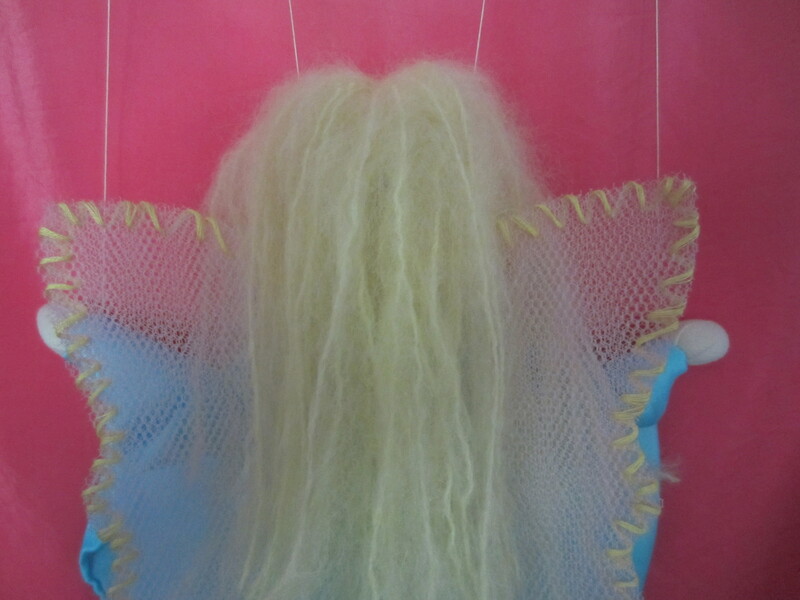 The wings are made from a few layers of light pink tulle. I whip stitched around the edge with a light yellow. I like a simple stringing for the marionette. I use one string for both hands and then another for the head. I go through the head horizontally above the ears. 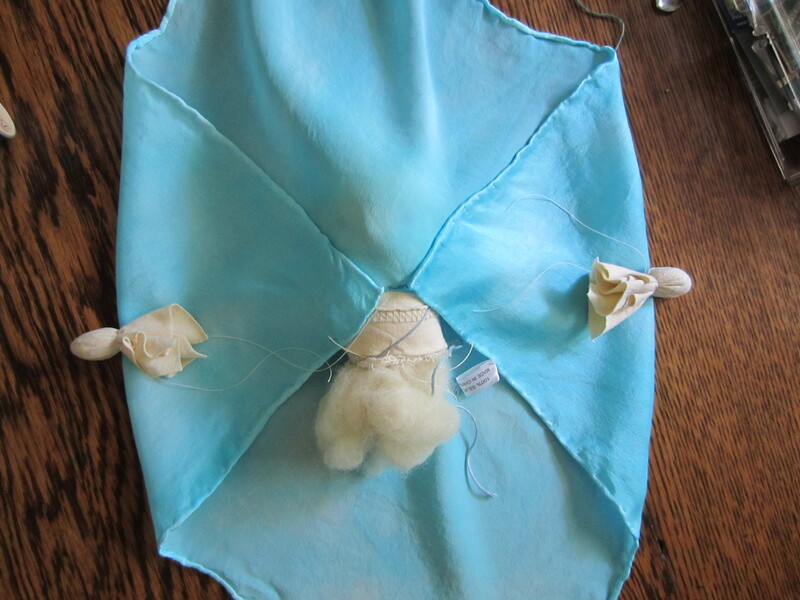 1” tubular gauze – I get mine from A Child’s Dream. Kool Aid- I followed the instructions to get Dark Brown at this tutorial. 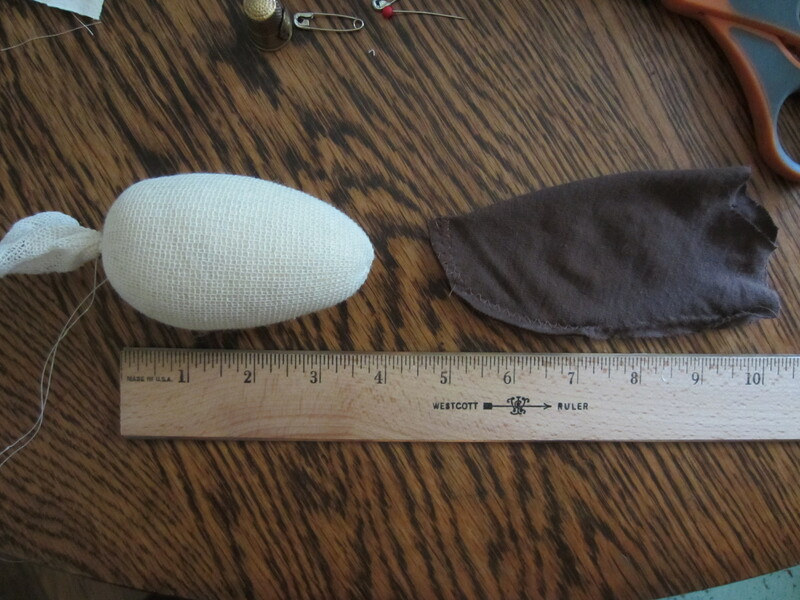 Using the 1” tubular gauze, I made a mouse-shaped head. It is about 4” long. 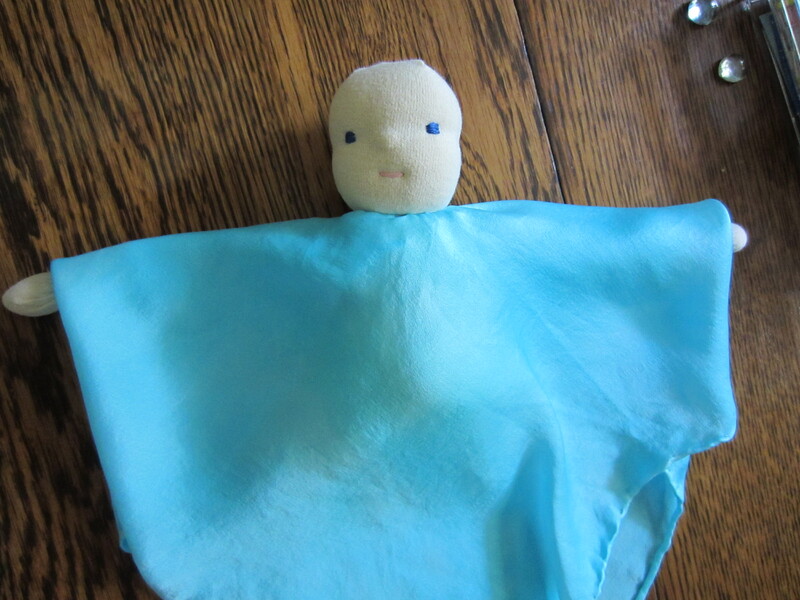 I made the skin to cover from a thrifted t-shirt and sewed up the end in the same way I do the top of a doll head. I added ears with a small piece of wool felt and eyes, nose and whiskers with embroidery floss. 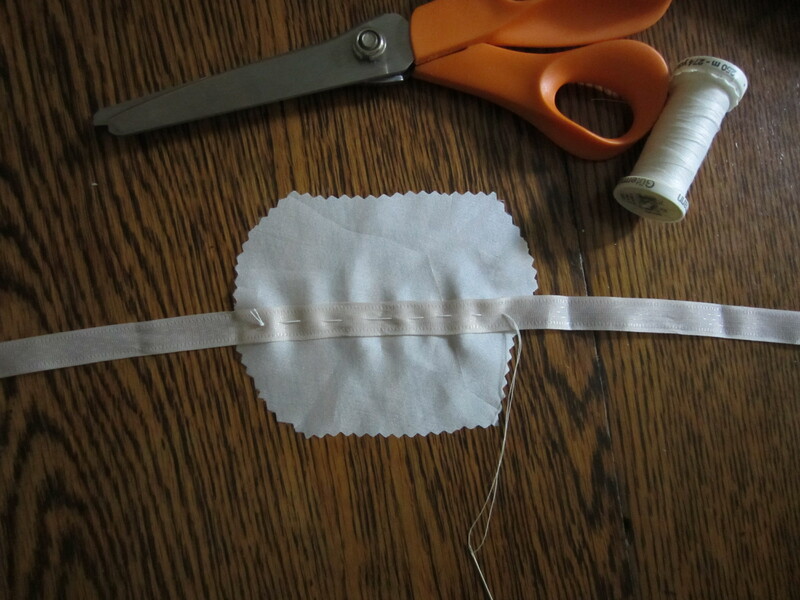 Because I am silk-hem challenged, I didn’t even want to cut the handkerchief at all. 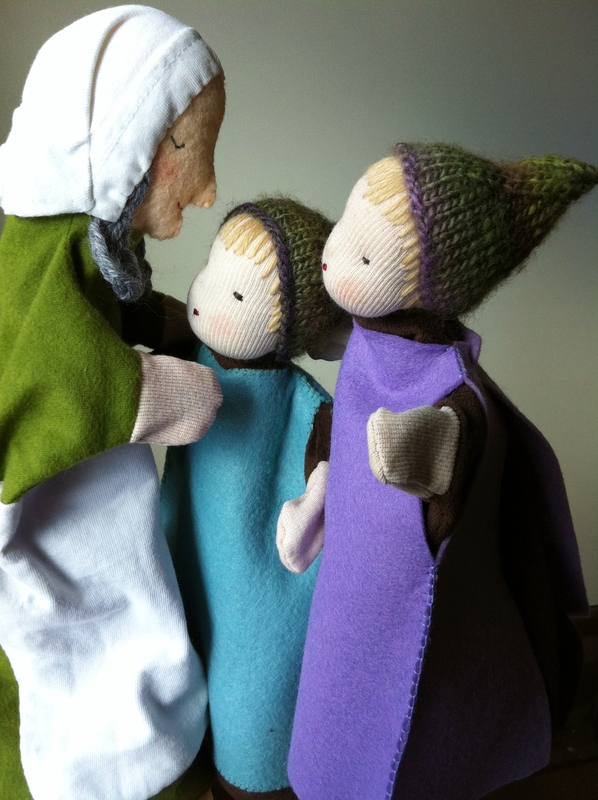 I rolled the tiny dew drop in a bit of wool and tied with strong thread to make the hands. If you don’t have any small dewdrops, then you can use small pea-pebbles. A little weight in the hands helps in working the hand strings. This stitch will be covered, so use whatever scrap of thread you have handy. 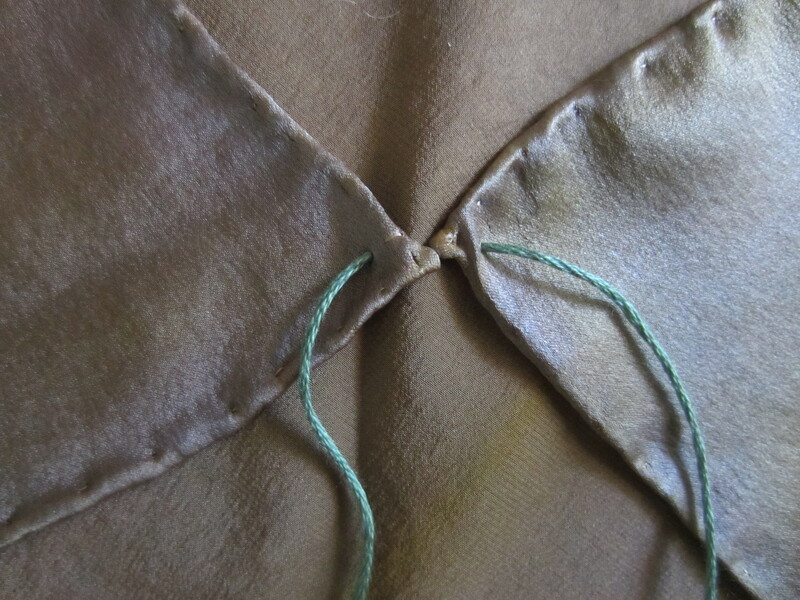 The stitch will connect both side corners of the silk and will go through the center of the silk. Fold over and you have a headless Jeremy Mouse. Sew around the neck. Making a mouse seemed to call for an oval. I use one string for the hands to make presentation a little easier. For Jeremy Mouse’s head string, running from ear to nose looked better and gave me more options for posing. Now it is time for pancakes! I look forward to seeing many interpretations of the Tiptoes and Jeremy Mouse characters from participants in our puppet swap. Signups are open till July 24th. 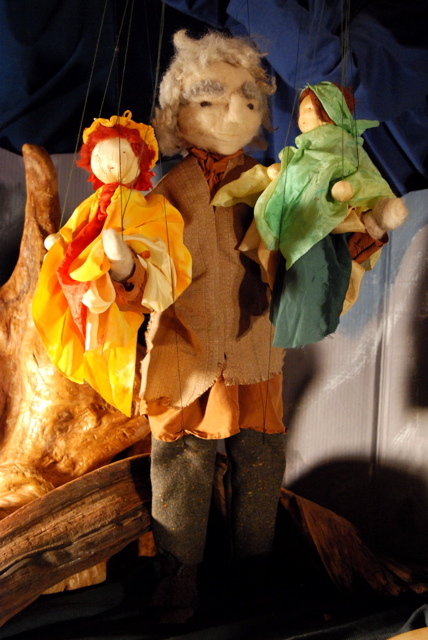 The first time I saw a marionette puppet show produced at the Waldorf School of Atlanta, I was blown away. The detail of the faces combined with the flowing silks captured me and brought the story to life in such a special way. Little did I imagine that 7 years later I would be making puppets myself and even producing the school’s 2011 Puppet show – making the puppets and set. So when communicating last year about a bird swap, Margaret of We Bloom Here, let it slip that she had been a professional puppeteer, I knew I had found a like-minded partner. 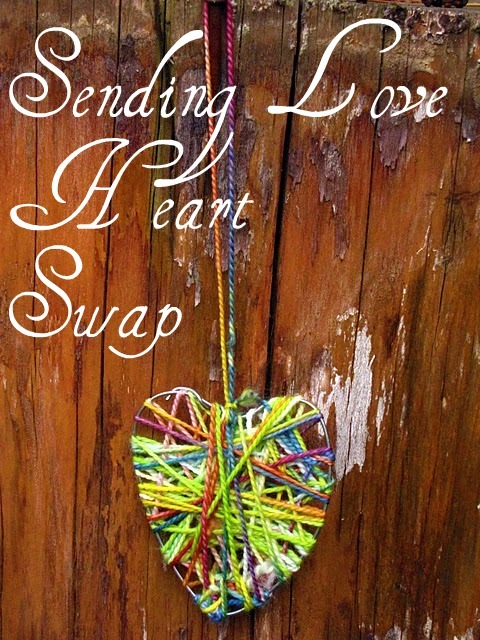 I thought it would be so cool if we co-hosted a swap and I emailed her with the idea. In our conversations, we realized that while we both loved puppets, we had our favorites. 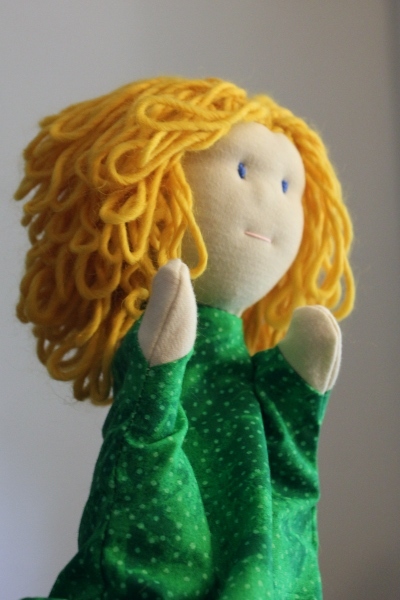 Margaret is drawn to glove puppets while I find a home in making marionettes. We decided that our swap would accommodate those folks who want to make either globe puppets or marionette puppets. We are finally ready to launch our puppet swap. The projects for this swap are more ambitious than is usual for most craft swaps that I have done before. Please be sure to read to the end carefully. The idea is that, at the end of this swap, each participant will have a pair of puppets, ready to go for storytelling and performance. There will be two options for this swap — You may sign up to create marionettes (and you will be paired with a swap-mate who wishes to make marionettes) or you may sign up to create glove puppets (and will then be matched with a participant making glove-puppets.) To help you along with the process, Margaret and I will be posting tutorials for creating both marionette-style puppets and glove puppets. 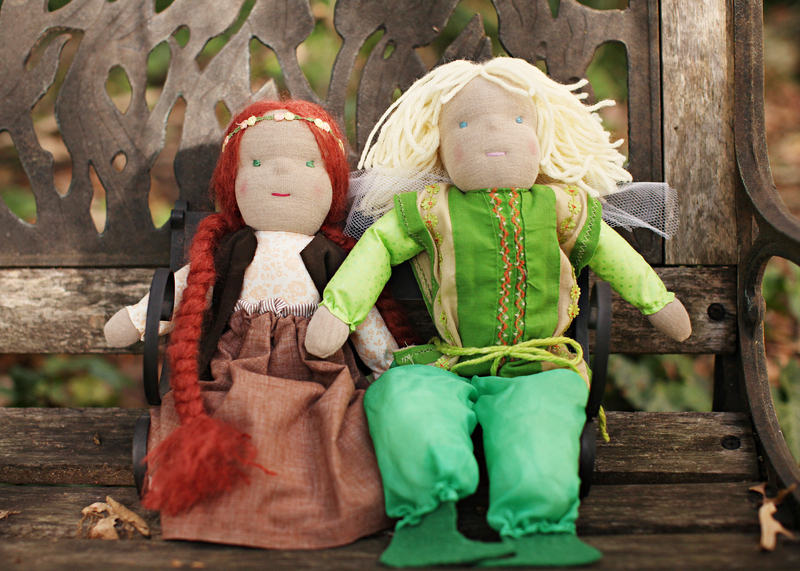 We will also be creating blog posts with additional ideas for stories and puppet-plays you can present with your new set of puppets. Watch for posts both here at Joy Grows and at We Bloom Here. 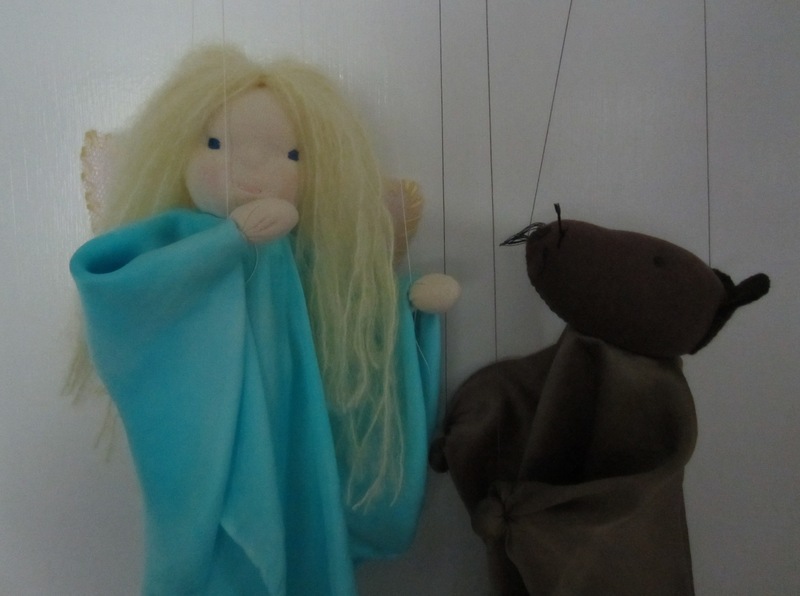 The marionette theme will be Tiptoes Lightly & Jeremy Mouse by Reg Down and the glove-puppet theme for this swap is The Story of the Root Children by Sibylle von Olfers. — Each participant will be matched with one person. — Each participant will create 2 identical puppets — one to keep and one to send to their swap-mate. — It will be up to the two swap-mates to decide which person will create two Tiptoes marionettes & which will create two Jeremy Mouse marionettes (and for the glove puppet swap, who will create two Root Children puppets and who will create two Mother Earth puppets.) This will require good communication between each participant and her swap-mate. 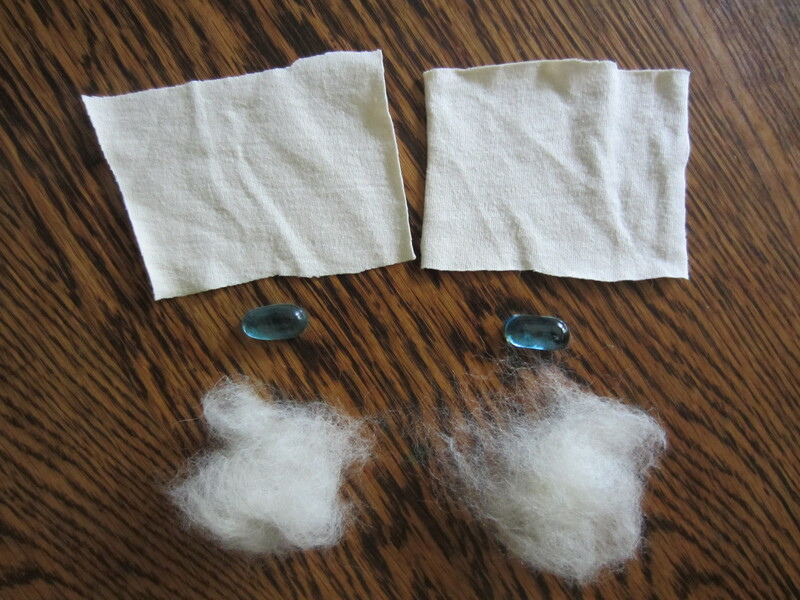 — Because this is a Waldorf-inspired swap, we are asking that, when possible, participants use natural materials: wool, cotton and silk are preferred. Please try to avoid synthetic materials. Note: Within the tutorial posts over the coming week, we will offer links to online resources where you may purchase supplies – just in case your stash requires bolstering! — Please feel free to interpret the characters of Tiptoes Lightly & Jeremy Mouse (and for glove puppets, Mother Earth and the Root Children) as you wish. Search for inspiration in your heart (and in your fabric stash!) The photos within this invitation and the illustrations from the books Story of the Root Children and Tiptoes Lightly are there to spark your imagination; variations and creative interpretations are strongly encouraged! — Sign-ups for the swap are open starting today, July 9th. — A short blurb about yourself as an introduction. This blurb will be sent, along with your other information to your swap-mate. 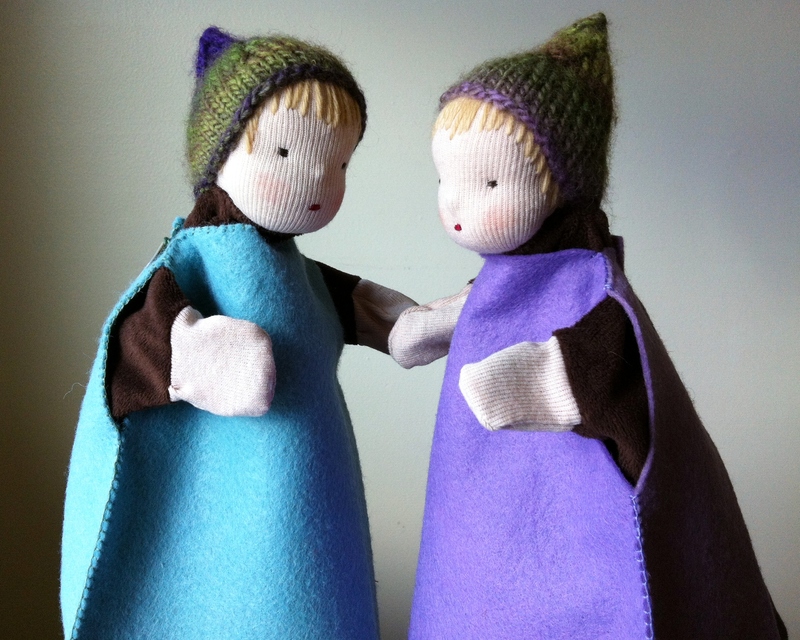 You could share about what draws you to puppet making – marionette or glove. Sharing a little bit about your experience with either the Tiptoes stories or The Story of the Root Children would be nice. You also could say something about your family, where you live, your favorite crafts, or you can tell us something else entirely. We just want to get to know you a little bit! If you have any questions please feel free to email me or Margaret. We will be happy to answer your questions or provide clarification regarding the guidelines for this swap. We are both very excited about this and we hope you will feel inspired, too!